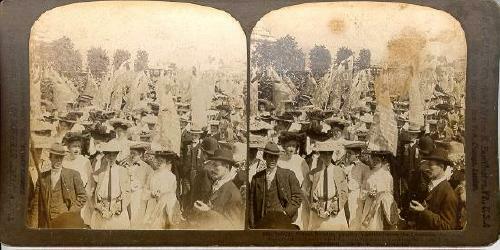 Louisiana Purchase Exposition, St. Louis, U.S.A.
H.C. White Co. (c)1904 by H.C. White Co.
with rounded corners. Dark Gray blank verso. Bumped corners and minor edge wear. Light stains on right photo. The largest stain at upper right has caused minor surface damage.